Little Blog Dress Media is very proud to partner with this project to help promote its wonderful story. In 1998, Sergeant First Class Garry White met the girl he was going to marry, Linda and they began navigating the complexities of Army life while the dream wedding they had planned turned into the "barely had time for a civil wedding ceremony" in 2000 before he had to report for duty overseas. Fifteen years and 5 tours of duty later, their "dream wedding" is coming true. They will enjoy the wedding of their dreams on Sunday, December 14. In fact, they will enjoy an entire wedding day with all the memories and none of the costs – thanks to Port Orange businesses. "We revere our veterans and public safety professionals and wanted to do something to recognize the fact that they dedicate their careers and risk their lives for us," said Craig Gittner, Owner of The Estate on the Halifax, an historic local wedding and event site, just a stone's throw from Daytona Beach. "We decided to provide our venue for a real wedding free of charge." Other local businesses were eager to join us in this Wedding of Honor so everything is being donated. "We extended an invitation for couples and we reviewed their stories as the basis for selecting our honorees," said Gittner. "We found a wonderful military couple right here in our community. Garry is a Military Science Instructor at Embry-Riddle Aeronautical University, whose military resume includes the 3 Bronze Stars and The Purple Heart," said Linda Cheatham of The Estate on the Halifax, which will be the site of the entire event. "His wife, Linda is a dedicated Army wife and mother of two who has supported her husband and shares her husband's love of the military. 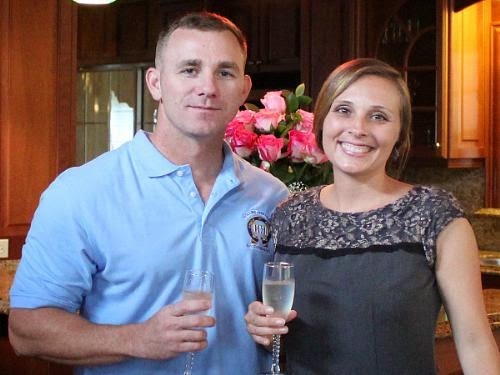 "We have been married fifteen years, have two children and have had a wonderful life together," said SFC White. "We hoped someday we would renew our vows in a wedding celebration, but wondered if it would really happen." Linda agreed. "We are blessed to do so and we will be mindful of others who may have had to forego a ceremony wedding, and hope they someday will experience one." About: Estate on the Halifax, a private ten-acre estate bordering the Halifax River in Port Orange. www.estateonthehalifax.com. I came to San Diego Wedding venues here and it was fabulous. The staff was professional and considering these folks had been working for about a week, they were doing a fantastic job. Wow what a great blog on Weddings of Honor. Thanks for sharing information Linda Cheatham. I would love to ask you where you had celebrated your special moment. I am planning to arrange my wedding at beautiful banquet halls in Miami, what you say about this hall?